In January 1530 a priest named Thomas Hitton was making his way to Dover to catch a ship to Antwerp. Walking through fields near Gravesend, a posse of men looking for a thief who had stolen some clothes from a hedge, stopped him & searched him. They found none of the stolen clothes on him, but they did find letters written to certain ‘evangelicals’ on the continent. Aware of a recent change of policy on ‘heretics’, he was handed over to the officers of Archbishop of Canterbury for interrogation. Hitton had recently visited William Tyndale and others in the Low Countries, and had returned to arrange distribution of forbidden books, including Tyndale’s new translation of the Pentateuch and the Psalter. Hitton was quickly interrogated, condemned, and burned alive at Maidstone on February 23rd 1530.
future of the English church and nation, over the coming decades. In all our enthusiasm for the literary beauty and grandeur of the King James Bible, published 400 years ago this year, Hitton's story, as is Tyndale's, is a reminder that the appearance of the English Bible was not a gentle, affair sorted out by committees, but was won with blood and fire. Bible translation was a dangerous business then. It could cost you your life. It still can. This week, Mary Gardner, another Bible translator lost her life because she had gone to Jerusalem to improve her Hebrew so she could better translate the Bible into the language of the people of Togo In west Africa. She caught in a blast that tore apart a bus, part of the ongoing tragedy of the Israeli-Palestinian conflict. No-one had heard of Mary Gardner before. She is a true heroine of the faith, joining the ranks of Hitton, Tyndale and numerous others who paid an ultimate price to allow others to read the subversive and life-giving message of the Bible. My new book "The Prodigal Spirit: The Trinity, the Church and the Future of the World" has recently come out. I thought I'd offer a few snippets of the book on the blog. 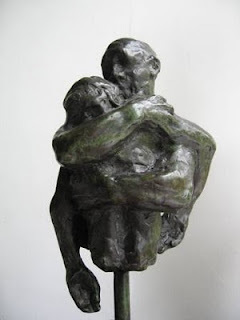 This is a section from chapter 1, looking at one of the main themes of the book, a contemplation of Charlie Mackesy's sculpture of the Prodigal Son, which imagine the image not just as a picture of the Prodigal Son being embraced by his Father, but also as a window into the Trinity. If we let our imagination run with this way of looking at the sculpture, it depicts God the Father embracing God the Son. In particular it suggests the Father’s embrace of the Son who is on the borderline between life and death. In this sense, the sculpture is a kind of Pietà, though not with Mary his mother cradling the dead Jesus in her arms, but the Father embracing the Son after his sacrifice on the cross. Bringing back the picture to its setting in the Prodigal Son story, the words of the Father: “for this son of mine was dead and is alive again” (Luke 15.24) makes the further connection with the resurrection. The image captures the embrace in which the Father catches up and brings to life the son who was dead and is alive again. Now of course there are only two persons in the picture – the Father and the Son, which leaves the question: where is the Holy Spirit? There is no visible depiction of the Spirit in the sculpture, but the way in which the image affects the observer hints at the role of the Spirit within it. That second level, the way in which many people have found themselves drawn into the image and begin to identify with the son, held and embraced by the father, is a sign of the place and work of the Spirit. If it were just a picture of a father and son embracing, it would simply be an interesting portrait of what might even be a self-enclosed exclusive love. Yet it is not. We are invited, welcomed into the picture – even into the very embrace between the Father and the Son, so that we begin to experience that same loving welcome, the same life-giving embrace of the Father for the Son. The Spirit is this invisible dimension of the sculpture – the invitation to become part of the embrace between the Father and the Son, to know and experience the love that pulses between the Son and the Father. Irenaeus spoke of the Son and the Spirit as the ‘two hands of God’ and how the Father does his work in the world through both the Son and the Spirit. It is a crucial reminder to us never to separate Christology from Pneumatology. It also suggests that if we can speak of Jesus Christ as the ‘Prodigal Son’ in the story, perhaps we should also imagine the Spirit as the 'Prodigal Spirit’. Just as the Son of God is sent from the side of the Father into the far country of a rebellious and hurting world, so the Spirit is sent from the heart of God into that same far country to draw creation back into the embrace of the Father and the Son. There is however a sequence about this. In the gospels, the Spirit is sent upon the disciples only after the Son has offered his life as atonement, risen again and ascended to the Father. Once the Son has been reconciled to the Father, the Spirit is sent into the world to draw it back into the heart of God which is the embrace between the Father and the Son. Pentecost follows after Good Friday, Easter and Ascension. The Spirit can only be sent after the restoration of the Son to the right hand of the Father (John 16.6). This is because the Spirit is related intimately to both Father and Son, and proceeds from the Father through the Son, from the very heart of the relationship between them, when the Son has returned to the intimacy of the Father’s right hand. In the terms of the Prodigal Son picture, the Spirit is sent to draw us into the embrace between the Father and the Son. To read more - buy the book - here!